By cleansing the liver, we're talking about inducing the liver to purge all of the fats, old cholesterol deposits, gallstones, poisons, drug residues, and toxic waste stored therein. Probably nothing else you do (including even the colon detox) will make a greater difference in your overall health. The liver is so important to our well-being that many healers maintain that most diseases cannot develop in the body (that, in fact, no form of cell degeneration can occur) if the liver is functioning in an efficient, healthy manner. Conversely, an unhealthy liver is very likely at the root of most serious health problems. 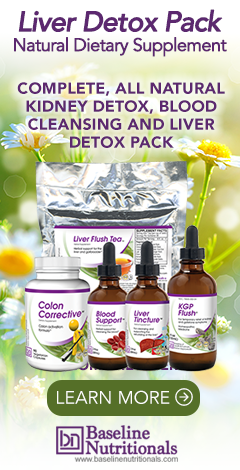 To learn more about the health benefits of a liver detox, see our main detox program, our click here to find out why you should do a liver detox. Note: It is vital that you do a colon detox before doing the liver detox. When the liver dumps, it dumps through the bile duct and out into the colon. If the colon (the drain pipe if you will) is plugged, the waste backs up into the blood stream and can make you feel extremely ill. This is the reason that the "Miracle Doctors" always start with the colon detox. It's the prerequisite for all the other cleanses in the body -- and, of course, can also produce dramatic healings in its own right. This is the Liver/Gallbladder flush recommended by Dr. Richard Schulze -- and is the one most people should opt for. It is done in the morning on an empty stomach for 5 days. Fifteen minutes after consuming this drink, follow with 2 cups of the liver/detox tea. It is also important to take 2 droppersful of the liver/detox tincture 3-6 times a day while on the 5-day cleanse -- and continuing after until the bottle is gone. After your morning flush, drink diluted juices and herbal tea throughout the day -- as much as you can drink. Try to consume 128 oz during the day. Also recommended throughout the day is to consume cups of potassium broth. Potassium broth takes advantage of the fact that the outside of a potato is one of the highest plant sources of potassium. Take the peelings (1/4" to 1/2" including the skin) of several potatoes. Do NOT use the inside. Add other well chopped vegetables to taste including carrots (with skin), celery , whole beets (including greens), fresh parsley, and lots of onion and garlic (up to 50 cloves). If you are so inclined (and you should be) you should examine what you deposit in the toilet. Look for "stones." The bile from the liver gives some stones their pea green color. But also look for black stones and red ones and brown one. And look for stones with blood inside them. (Note: Oftentimes, the olive oilis converted into little "soap beads" in the intestinal tract, and many people confuse these little beads with actual stones.) If you do not notice anything, it does not mean it is still not working. During the course of a cleanse, it's not uncommon to pass some 2,000 of these stones. Be glad. The more you pass, the healthier you become. You may also find untold numbers of tiny white cholesterol "crystals" mixed in with the waste. The tincture is crucial in that it contains herbs that help the liver to rebuild and regenerate itself. A secondary benefit is that it will significantly reduce the liver's release of LDL cholesterol. The key herbs include milk thistle, dandelion root, the perennial herb picrorhiza kurroa (sometimes called kutkin, or "Indian milk thistle), and artichoke or beet leaf. But what we're talking about here is something different. We're talking about using herbal blood cleansers to remove toxic residues from the blood so that it is inimical to cancer and tumors. The great blood cleansing herbs are: red clover, burdock root, chaparral, poke root, and sheep sorrel. These are the herbs you will find in the famous blood cleansing formulas such as the Hoxey formula, the Essiac formula, and the Dr. Christopher and Dr. Schulze formulas. These herbs can literally "drive" tumors out of the body. My galblader was removed 4 weeks ago. I'm still wants to throw up all day. I need a good plan to detox my colon and liver. Help!! My sister and I both have acute intermittent porphyria and would be very interested in liver detoxing. I also have an irritated gall bladder in associated with porphyria attacks. Your site lists what herbs to add to a tincture but what do I use as a base for the tincture? Rather than trying to make your own tincture, you might want to try buying a tincture already made by a reputable company. For recommendations, check out http://www.jonbarron.org/natural-health/program-dietary-supplements-product-recommendations. On a different note, although we cannot diagnose or prescribe for specific medical conditions, you might want to do some research on the internet about the possible advantages for someone suffering from porphyria of using alternative health methods such as coral calcium or alkaline drops or ionized water to raise body pH. It sounds like you’re actually talking about the liver detox, not the blood cleanse. And for those who don’t want to do the full liver flush, there is a slow and easy version that will give you 70 to 80 percent of the benefit without the difficulty. As part of your daily diet, just eat one cup of raw, freshly grated beets mixed with olive oil and lemon juice for thirty days straight. Daily use of a liver detox tea is also required. Using one bottle of liver tincture is recommended. And you will still want to soften any stones using the kidney flush beforehand. If you’re actually looking for just a blood cleanse, that’s not as difficult when done by itself, and you can find information for that at http://www.jonbarron.org/detox/program-barron-report-blood-cleansing. It is just a daily tincture. I have done a version of liver flushing on and off for over 10 yrs. After caring for my mom and not being able to do as much of the flushing for a 4 yr period, I was having the beginnings of what I thought was pancreatic pain and my labs showed an increase of p. enzymes so I elected to have gb surgery since function had deteriorated to 7% down from 14% when Ii began flushing. Two years ago, raised P. E. and in the past 6 months symptoms like those before my surgery appeared so I researched and started doing flushing again. I just had a possible acute pancreatitis attack after the last flush when I resumed eating. I am wondering if the mild version of flushing you mentioned above would work for me. I know you cannot advise but is there a caution you are aware of? When you say a "version" of liver flushing, what does that mean? There are some intense liver detox protocols out there that Jon does not recommend. For those, we really can not comment. "And for those who don’t want to do the full liver flush, there is a slow and easy version that will give you 70 to 80 percent of the benefit without the difficulty. As part of your daily diet, just eat one cup of raw, freshly grated beets mixed with olive oil and lemon juice for thirty days straight. Daily use of a liver detox tea is also required. Using one bottle of liver tincture is recommended. And you will still want to soften any stones using the kidney flush beforehand." Regarding treatment of MRSA infections, also check out info on website for product called pHenomenal water. Company owner's son had MRSA infection that was cleared using this very stable high pH water. I have personally met owner, Shannon Brown, and his family and have used his product to reduce acidity in my body. Good luck! Would aoso like to know do I have to by all the teas. Shops by us don't sell all the teas. Just make sure you clean your colon before the liver detox or you risk getting very sick. I would read Jon Barron's book about detoxing to undertand the entire process. We offer a free download at the top of this page. Do some research about colloidal silver. I have been reading its very good for killing staph MRSA. The more I have learned about detox, the more blown away I have been! There is so much we can do for our bodies, without the help (or cost!) of “conventional” medicine. Rather than masking the problems, as conventional medicine does, the right detox products and processes make our bodies truly healthier and “younger.” Definitely amazing stuff. Is there anything special I should do to detox my body from 2 large doses of the contaminated steroids? Fungal meningitis tends to infect people with weakened immune systems and people who are taking steroids. Getting injected with contaminated steroids just ups the odds. You can’t actually “detox” pathogens out of your body. Detoxing doesn’t work like that when it comes to pathogens. But you can boost your immune system to help your body resist them, and you can take natural anti-pathogens to directly destroy them. Question about Liver/GallBladder Flush. Found one that requires an Epson salt drink on the last day, Do you recommend this step??? Not if you’re using a colon corrective formula on a daily basis while detoxing. Dont be sad. My son had facial acne which seemed to be getting worse. It all went way when he started to cleanse with pure raw honey! It worked. Simply wash face with raw honey as it was soap. Make sure to rinse well with water then pat dry. You can use raw honey to wash your face even if you dont have acne. It leaves skin smooth. Enjoy! I am over weight I want to loss the weight but sweet thing keep tempting me .I see your program has was of helping me and I think going to try it. we have severre mold toxicins losing our hair skin life. out three cats died. i also have cfsids daughter has CP brain damage mold has cause personality disorder. she won't take anything now. i ordered oregenol and got termanic spice which this person told me that help health deteration. my kitties have goldenseal olive leaf, cranberry mix. heard cats can't tolerate mold toxicins in liver. been trying to move from here for since 2008. fungus on my skin taking ant fungal med, liator pharmacy said no. do not take these. so i type in liver detox because my daughter needs help she refuses go to the doctor. we have the stove on for heat probably carbon monixide. lost muscle skin bone mass. i know that herbs are the best way to detox. have sores on my feet the fungus med only thing help it from traveling into my hip causing severe pain. please help. daughter probably eat beets, that was my grandmas remedy with vingegar. she has mold on her scalp i do too use vinegar to cleanse from skin. if my spelling not good neither computer having rough time. An Alternative Liver Detox (30 Day Cleanse) where you mentioned to use freshly grated beets - do you mean beetroot? I have Cushings disease, an underactive thyroid, asthma and high cholesterol. Will detoxing affect my medication [I take T3] and would it really help these conditions please.